1 Dozen Roses - Ah, Whatta 'Bout Mimi! We will assume you want red unless you tell us differently. Also available in pink, hot pink, and white. 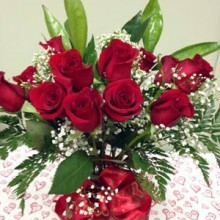 Nothing says it like a dozen red roses! Includes a beautiful heavy glass vase and matching floral bow. We will "bling" it up to send just the right message. Click the button below to add the 1 Dozen Roses to your wish list.